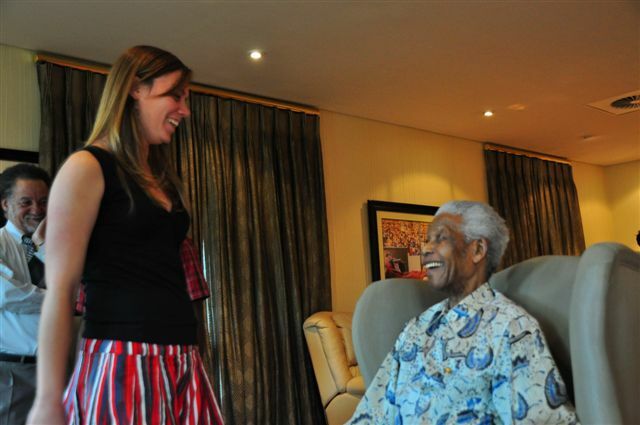 As a Mandela Rhodes scholar of the 2010 cohort I was one of the lucky people who got to meet Nelson Mandela. I still feel tremendously honoured to have been selected for the scholarship. Just applying for it and going through the exercise of drawing connections between my life and the values that Nelson Mandela has stood for made me see my leadership in a new light. Especially the “Aspire to Be” document, which was developed as Mandela, Prof Gerwel, Shaun Johnson, the Rhodes Trust and others dreamed up this scholarship, really spoke to me. Something between a poem and a credo. Having been awarded the scholarship and meeting the other scholars was actually honour enough for me. When we were told we may get to meet our patron, I would say I was even mildly unwilling. Certainly the fact that we were expressly and repeatedly told that he may cancel at any minute – for health or any other reason – did not worry me. I knew that I would only get a few seconds with the man and didn’t imagine any valuable exchange could take place. I was concerned to be wasting his time. He had retired from public life and I wanted to grant him some peace. Instead, I imagined, he was being asked to do yet another bunch of visitors a favour. I felt like a tourist. Also, in the back of my mind, over the years, I had developed a sense that I was not really needed as a leader. White Afrikaans leaders were something of the previous generation; my background did not place me in a position to understand and address the challenges of my time. I began to suspect that I was embracing leadership, partly for others, but to be honest also just out of curiosity and maybe a bit of egoism. Being on the SRC in particular was not a very comfortable experience; I was quite self-conscious; perhaps more than I was conscious of vision and need. On the day, we were told that Mandela was actually excited to meet us; that he had insisted on meeting us. As we were driven to the house in Houghton I began to realise that the Mandela Rhodes scholarships was something that he had dreamed of. That I was one of the young African leaders that he and the others had felt compelled to identify and empower because of the daunting challenges that they saw lying ahead for the continent. The Madiba magic is real. I was introduced to him and I shook his huge hand. Even sitting in a chair, he was tall. He was also struggling to hear me, and Prof Gerwel and Shaun had to amplify my words to him. He cracked a joke about the Western Cape (“I know it very well… I spent 27 years looking at it!”) which I am told he tells often. That was lovely. But what I will take away is the eagerness with which he met me. I have realised because of meeting Nelson Mandela, that self-indulgently gazing at my white navel is a waste of precious resources. This is true for everyone (regardless the colour of your navel) so feel free to apply to it yourself, but it is also true for me. Mandela was worried about the Africa he would leave behind, and he dreamed and hoped that there were young people ready to lead. I knew from how open he was when he met me that I am part of what gives him hope for the future of our continent. Looking at the photos afterwards I saw how Professor Jakes Gerwel had enjoyed the moment. I am going to treasure the picture of the late, great Prof hiding his smile behind his hand, just as much as the image of Madiba shaking my hand. I am so humbled to think that, as a Mandela Rhodes scholar, I symbolise hope to people like Mandela and Gerwel. I am such a selfish and immature person and I know that in my own strength I am unlikely to achieve anything of significant benefit to others. At the same time meeting the incredible Nelson Mandela has made me realise that I – and everyone else who hopes to contribute to Africa’s future – must stop this apologetic nonsense and find a way to do something useful. There’s plenty of work to be done.